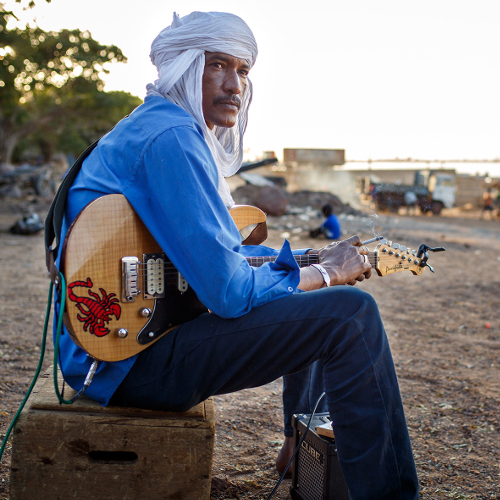 Mali, situated in the heart of West Africa, is the cradle of today’s Blues and Jazz. It is believed that slaves brought their traditional African rhythms and sounds to the North American cotton fields. 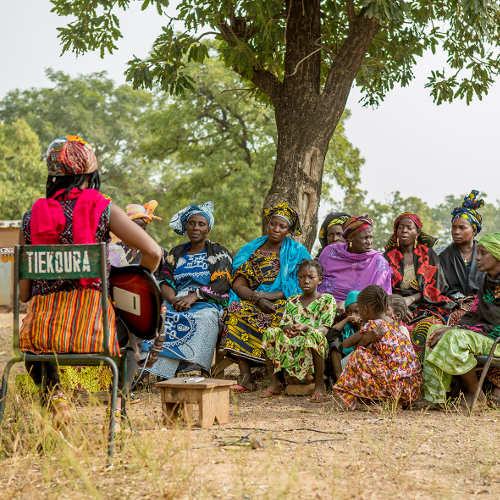 For centuries music has strengthened Mali’s cultural identity, with musicians holding strong positions in society. 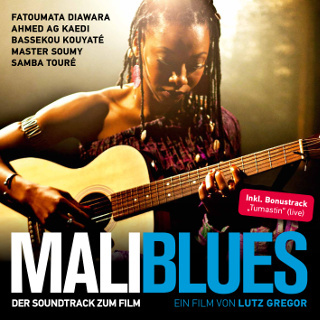 Following Fatoumata Diawara, shooting star of the global pop scene, MALI BLUES is a musical journey, in which we explore the country’s rich musical culture and its threat by radical movements. On our way we meet other committed musicians, who are fighting for unity and the freedom to express themselves through their music. 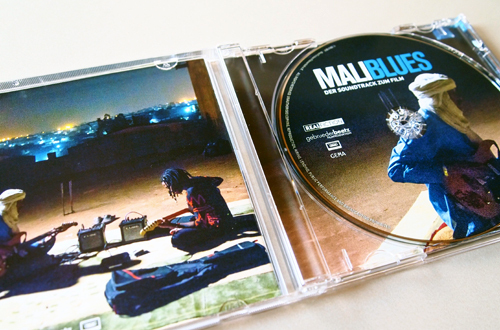 The MALI BLUES soundtrack takes us further on this musical journey and introduces us to unique artists such as Tuareg musician Ahmed Ag Kaedi, famous Ngoni player and traditional Griot Bassekou Kouyaté, Malian Rapper Master Soumy and of course Fatoumata Diawara. Written by Ahmed Ag Kaedi · Performed by Amanar de Kidal & Omniversal Earkestra · Licensed courtesy of Omniversal Earkestra · Published by Omniversal Earkestra · AMANAR DE KIDAL with the OMNIVERSAL EARKESTRA recorded Live in Concert from Sahel to Saturn at unknown Berlin Caravanserei on September 26, 2016 · Johannes JB Böhmer (tp) · Fabian Enceladus Engwicht (tp) · Robin Shere Kahl (tp) · Alistair Duncan (tb) · Till Künkler (tb) · B.B. König (tu) · Sam Hudson (as) · Paulophon Berberich (as, fl) · Johannes Mono Schleiermacher (ts) · Oliphant Catfish Fox (ts) · Franz C Stahl (bs) · Ahmed Ag Kaedi (g, voc) · Issa Ag Adani (g, voc) · Balla Kouyate (b) · Baron Atlas von Enkelmann (b) · Mahalmoudou Traore (d) · Kofi Bernardt (perc) · Mood ’ngodo (howl’n’possession). achieved success in Europe. It also examines the country’s battered music scene in the aftermath of the attacks on music by Islamic extremists. 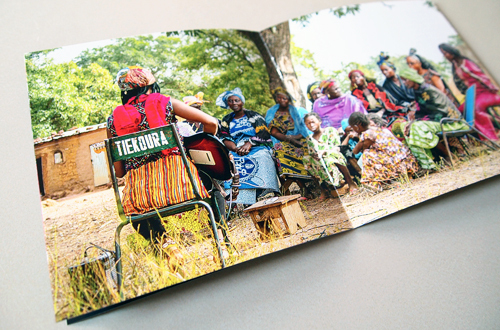 There are four songs by Diawara, all featured on her debut album, Fatou, although the version of ‘Boloko’ heard here is a live recording. Then there are three from that glorious ngoni (lute) virtuoso Bassekou Kouyaté, including the rousing ‘Desert Nianafing’, on which he and his band Ngoni ba are joined by the great Afel Bocoum and by Ahmed Ag Kaedi, who further demonstrates his guitar skills on three contributions by Amanar, the desert blues band he leads. There’s more Malian guitar blues from the excellent Samba Touré, and, in contrast, a couple of hip-hop tracks from the energetic Master Soumy. If the film is as good as its soundtrack, it is well worth seeing. A film and a soundtrack, Mali Blues travels to the heart of West Africa to introduce us to its rich musical culture and four artists in particular, global star-in-the-making Fatoumata Diawara, ngoni player and traditional Griot Bassekou Kouyaté, Malian rapper Master Soumy, and Tuareg musician Ahmed Ag Kaedi. 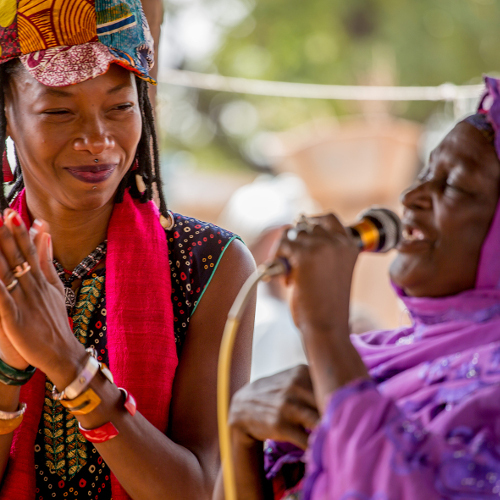 Director Lutz Gregor’s 2016 documentary follows Diawara (known as Fatou) who, having fled Mali as a young woman to escape an arranged marriage, is seen preparing for her first-ever concert performance in the southern Mali city of Ségou at the Festival of the Niger in 2015. In addition to documenting her concert tour, the film shows her meeting with Ahmed Ag Kaedi, who fled his desert home for a different reason: fundamentalists threatening to cut off his fingers. 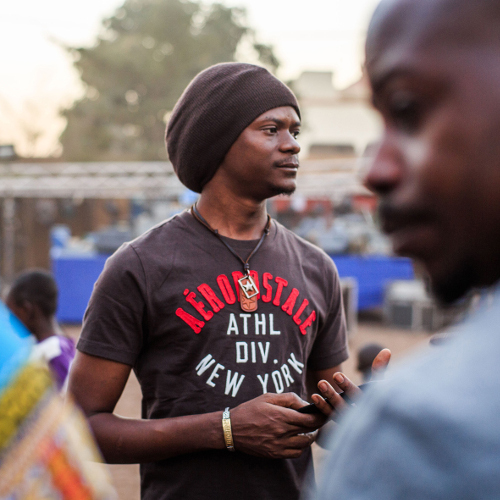 Not only have individuals been threatened but so too has the entire musical heritage of Mali: in 2012, a ban was instituted by radical Islamists that saw radio stations destroyed and musicians forced into exile. If Diawara is the ‘star‘ of the documentary, so too does she stand out on the soundtrack; in that regard, it doesn’t surprise that she not only appears first but does so with the recording’s most infectious song, the irresistibly hummable “Sowa.” Her acrobatically smooth vocal delivery is certainly a major part of the song’s appeal, but its lilting swing and melodic hooks bolster its allure—the kind of AfroPop you want to revisit the moment it’s over; also strong is “Kanou,” whose breezy lilt works a hint of João Gilberto-styled bossa nova into its African swing. Even without visuals, Diawara’s radiance shines through all four of her contributions, the opener especially, and the material certainly suggests she has the potential to become a major international star. A bluesier side of Mali’s music arises during Bassekou Kouyaté and his band Ngoni ba’s “Desert Nianafing” when the tune features both Kouyaté’s centuries-old ngoni string instrument (said to be a precursor of the banjo) and the controlled wail of Ahmed Ag Kaedi’s guitar; Kouyaté’s ancient stringed instrument is more prominent in “Wagadou,” though one’s attention is as much drawn to the song’s impassioned vocal performances. Master Soumy (Ismaëla Doucouré) clearly has his ears close to the ground, at least insofar as “Explique Moi Ton Islam,” with its vague echoes of “Gangsta’s Paradise,” is representative of the rap singer’s style. 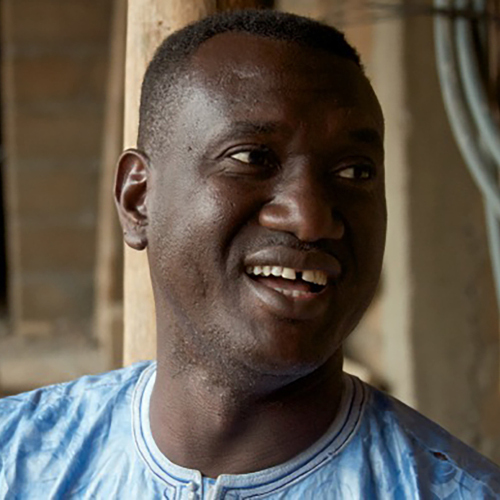 On the soundtrack, Diawara is represented by four songs, Kouyate three, Soumy two, Samba Touré one, and Ahmed Ag Kaedi three (the songs written by him but, as credited, performed by Amanar de Kidal); three of the thirteen pieces are live tracks, including an eleven-minute bonus, “Tumastin,” a loping rouser performed by Amanar de Kidal and the Omniversal Earkestra. Though the singing isn’t in English, the soundtrack is easy on Western ears, especially when the songs are rhythmically driven, prominently feature guitars, horns, synthesizers, and drums, and are often stylistically reminiscent of Western styles such as blues, rock, and hip-hop. Właśnie ukazała się ścieżka dźwiękowa do ubiegłorocznego filmu dokumentalnego o malijskich artystach. Tak się składa, że muzyka z Afryki często pojawia się na łamach Nowej Muzyki, a szczególne miejsce zajmuje Mali. Wystarczy przypomnieć składankę z zeszłego roku „Every Song Has Its End: Sonic Dispatches From Traditional Mali” (Glitterbeat), koncertowy materiał Tamikrest z okazji Record Store Day („Taksera”) oraz ich niedawno wydany album „Kidal”, a także sprzed dwóch lat płytę Bassekou Kouyaté & Ngoni Ba – „Ba Power”. Ten ostatni artysta, Bassekou Kouyaté, powraca w filmie niemieckiego reżysera Lutza Gregora – „Mali Blues”, który miał swoją premierę w czerwcu 2016 roku. Dziwię się, że nie ma tego obrazu w tegorocznym programie festiwalu AfryKamera. Kluczową postacią „Mali Blues” jest malijska wokalistka, gitarzystka Fatoumata Diawara. Jeszcze jako bardzo młoda dziewczyna uciekła z Mali do Francji, w obawie przed zaaranżowanym małżeństwem. W 2015 roku wraca do swojej ojczyzny, by zagrać na tam swój pierwszy koncert w mieście Ségou położonym w południowo-zachodniej części Mali nad rzeką Niger. Gregor chwycił za kamerę i towarzyszył Diawarze nie tylko czasie jej występów, ale też w trakcie spotkań z malijskimi twórcami, choćby takimi jak Tuaregiem/gitarzystą Ahmedem Ag Kaedim (znamy go jako Amanar), Griotem i wirtuozem gry na ngoni Bassekou Kouyaté, czy raperem Ismaëlem Doucouré (Master Soumy). Płyta „Mali Blues – Soundtrack” (21.04.2017 | Gruenrekorder) pomieściła trzynaście kompozycji. Większość nagrań pochodzi ze znanych już wydawnictw opublikowanych przez World Circuit Music, Sahel Sounds, Glitterbeat. Mamy studyjne (m.in. piękny blues Samba Touré), jak i koncertowe fragmenty. Cały materiał ułożył się w bardzo dobry zestaw, a bonusowy numer „Tumastin”, z koncertu tuareskiego gitarzysty Amanara z udziałem Omniversal Earkestra, znakomicie przedstawia siłę tradycyjnej muzyki malijskiej w otoczeniu jazzowego transu. Der Spielfilm „Timbuktu“ des malischen Filmemachers Abderrahmane Sissoko war nahe dran, in Cannes einen Preis abzustauben. Dass es dann letztendlich doch nicht geklappt hat, lag keinesfalls daran, dass der Inhalt nicht 100%ig gepasst hätte. Viel eher fehlte vielleicht das entscheidende Quentchen Glück, vielleicht aber auch ein insgesamt mangelndes Interesse am schon länger schwelenden Konflikt, der in Mali durch islamische Milizen heraufbeschworen wurde. Das Thema „Bürgerkrieg in Mali“ bleibt aber dennoch auf der Agenda all derjenigen, die das unsägliche Treiben von Al-Qaida verfolgen. Unter ihnen ist auch der Filmemacher Lutz Gregor, der den Dokumentarfilm „Mali Blues“ in die Welt gesetzt hat und der die Geschichte von vier malischen Musikern erzählt, die für einen toleranten Islam kämpfen. Allen voran die Singer-/Songwriterin Fatoumata Diawara, die das Land verließ, um nicht zwangsverheiratet zu werden. Aber auch der Ngoni-Spieler Bassekou Kouyaté ist ein weltoffener und weitgereister Kritiker der augenblicklichen Zustände. Zur jungen Generation Malis zählt der Rapper Master Soumy, der mit seinen Texten nicht nur aufrütteln will, sondern auch als einer der wenigen Verantwortliche beim Namen nennt. 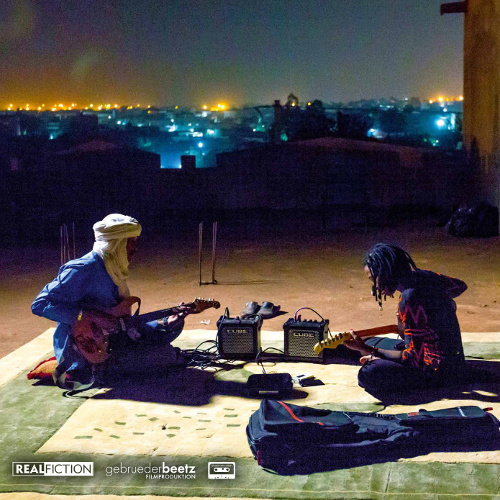 Der vierte im Bunde ist der Tuareg-Musiker Ahmed Ag Kaedi, der aus dem Norden Malis nach Bamako fliehen musste, um sowohl körperlich als auch künstlerisch zu überleben. 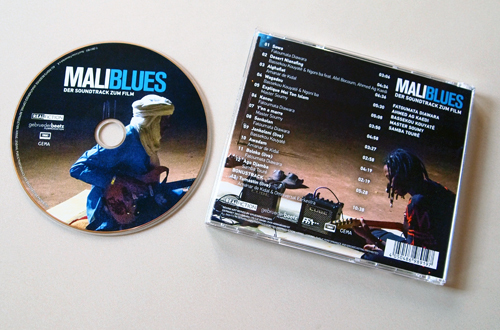 „Mali Blues“ ist demnach eine sehr abwechslungsreiche CD, die die verschiedenen künstlerischen Strömungen Malis sehr gut widerspiegelt. Eindringlicher Blues, tiefgründiges Songwriting und die typische Instrumentierung machen diese Filmmusik zu einem beeindruckenden Hörerlebnis. Lediglich die HipHop-Anteile drücken etwas das hohe Niveau, denn trotz vermutlich wichtiger Aussagen (die man aber leider nicht übersetzt hat), stehen die Musikanteile auf eher schwachen Füßen. Trotzdem ist dieses Album ein ziemlich wichtiges Statement für afrikanisches Selbstbewußtsein.